Experts say that Moscow earned the right to a base in Tartus as remuneration from Damascus for its assistance in the war against the Islamic State. Photo: The Russian missile cruiser Varyag, with the Russian navy destroyer Vice Admiral Kulakov in the rear, on patrol in eastern Mediterranean. Russia and Syria signed an agreement to transform the naval repair and docking facility in Tartus into a full-fledged naval base. Up to 11 Russian warships will be deployed in the eastern Mediterranean within the next few years. On Jan. 20 Moscow and Damascus signed a 49-year old agreement to modernize the repair and docking facility in the Syrian port of Tartus. Upon the agreement’s expiration, a 25-year extension will be automatic unless one side informs the other a year in advance of any desired changes. The Tartus naval repair facility was built by the Soviet government in 1977, and it’s the only Russian naval facility in the Mediterranean Sea. Experts say that Moscow earned the right to a base in Tartus as remuneration from Damascus for its assistance in the war against the Islamic State and other extremist terror groups supported by the Gulf Arab states and the U.S.
Until recently, the Tartus facility was nothing but a floating pontoon for rudimentary ship repair. According to the new agreement, Russia will build a full-fledged base at Tartus and have the right to deploy up to 11 ships in the area. "We’re beginning major construction of military infrastructure - a wharf, barracks, headquarters, ammunition storage, and etc.," said a retired Colonel Mikhail Khodorenok, a military observer at the online publication, Gazeta.ru. "Tartus will turn into a naval base headed by a fleet vice admiral." Khodorenok added that it would take two to three years to build the base. The number of servicemen stationed there will depend on the number of ships deployed in Tartus, and it’s highly unlikely that 11 ships will be docked in the region at the same time. Instead, most likely about five ships will be based in Tartus on a regular basis, while visiting ships will appear from time to time. 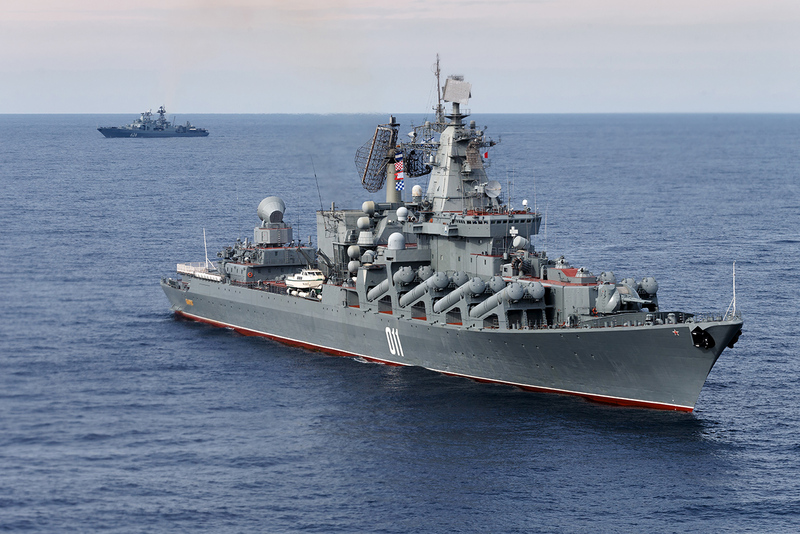 "Today, there is no serious threat to Russia that requires Moscow to deploy a large naval group in the Mediterranean," said Vadim Kozyulin, a professor at the Academy of Military Sciences. Anyway, Russia doesn’t have such a large amount of naval hardware immediately available." "Ships that are part of the Admiral Kuznetsov aircraft carrier group will be stationed at the base, and most likely these will be ships from the Black Sea and Northern Fleets - large landing, patrol and anti-submarine ships," said Kozyulin, adding that he believes the nuclear cruiser Peter the Great and the Admiral Kuznetsov aircraft carrier will require additional infrastructure. "Tartus is one of the pillars of Russian influence in the Middle East, and no one knows how events will develop in the Middle East, in the world, and in Russia in the future," said Gevorg Mirzayan, an associate professor at the department of political sciences at the Financial University under the Government of the Russian Federation. "Russia needs to be present not only in the Black Sea, which NATO can close at any moment, but also in the Mediterranean Sea." Mirzayan said Russia is the bedrock of Syria’s security because the country’s neighbors still want to undermine Damascus. "Syria needs Russia to counterbalance Iran because Teheran will want to have leverage and put pressure on Syria," explained Mirzayan. "This is why Damascus is interested in our strong presence in the region. For Bashar Assad this means long-term investment in the future and the possibility to obtain a strong ally for many years to come."